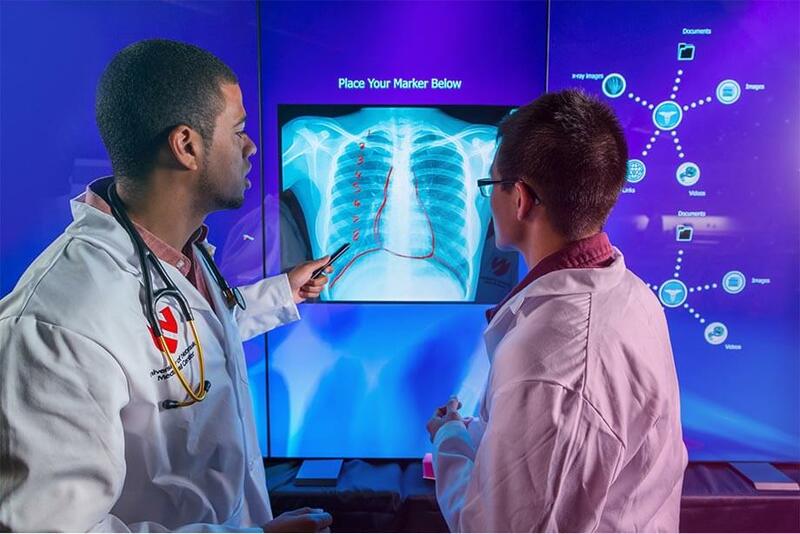 In the world of health care education, AVI-SPL is a leader in installing emerging simulation technologies, from advanced human patient simulators and task trainers, to augmented, virtual and immersive reality, as well as the MultiTaction iWall. AVI-SPL specializes in designing health care education environments where learners acquire knowledge, and experience hands-on training in a wide range of realistic but simulated healthcare environments. Under this paradigm, students practise using a wide range of simulation technologies until they become proficient in procedural and professional skills before encountering real-life patient care situations. AVI-SPL’s mission to accelerate the adoption of modeling and simulation technology will reshape the way in which medical education is delivered. We spoke with Bill Schmidt, AVI-SPL Sales Director and Visualization Advocate. The MultiTaction solution has low bandwidth requirements with ultra-low latency, even replicating high-resolution video in perfect synchronisation with no loss of image quality. This makes the iWall a powerful tool for collaboration and remote learning. AVI-SPL and MultiTaction recently partnered at the University of Nebraska Medical Center, (UNMC), iEXCEL center. Within the state of Nebraska, there are many rural and underserved communities, and iEXCEL desires to serve these remote communities and offer the same standard of training and technology across the state. UNMC satellite campuses cannot count on a lot of bandwidth being available on demand, because the ISP providers in some areas of Nebraska are not always robust. This meant that AVI-SPL had to find a low bandwidth solution for collaborating across distance. “The MultiTaction iWall is the ideal solution when bandwidth is a concern,” says Schmidt. iEXCEL plans for iWalls at several other sites in the State of Nebraska, with upcoming installations planned for Lincoln, and then Kearney. “With this network of iWalls, the students and faculty will be able to collaborate easily and in real-time across distance,” says Schmidt. THE MULTITACTION SOLUTION HAS LOW BANDWIDTH REQUIREMENTS WITH ULTRA-LOW LATENCY, EVEN REPLICATING HIGH RESOLUTION VIDEO IN PERFECT SYNCHRONISATION WITH NO LOSS OF IMAGE QUALITY. can learn without fear of harming a patient, and practise until they are ready to take excellent care of a patient. Download the full case study to learn how the unique relationship between MultiTaction and AVI-SPL will transform health care education, as the iWall’s advanced visualization solutions enhance outcomes and lowers costs.